3). Add mixture to ice cream machine and churn until firm. The ice cream turned out wonderfully! 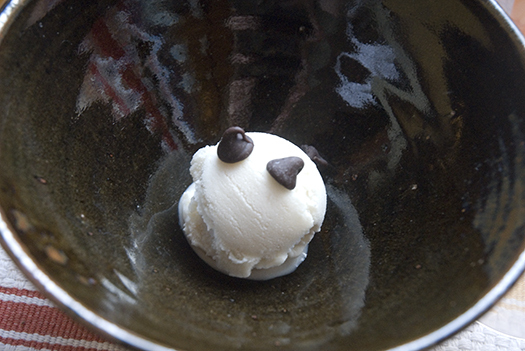 It has a great, creamy consistency and scooped nicely. Em and Tobyjoe both ate it up. I put a few chocolate chips on top and voila! Let me know if you have any questions and/or suggestions. Previous Post We're Back. Sort Of. Next Post The The Books. Trader Joes always has coconut milk in stock. It’s cheap too. Coconut milk comes in 3 general grades – first press , regular, and light. First press is basically the juice squeezed out of shredded coconut; light is usually the pulp soaked in some warm water, then squeezed again; regular/unmarked is the two mixed. There’s a huge difference in taste and quality between them. First press is delicious, but often too rich; light is too light. I prefer medium. I still do the vegan thing every April ( damn Toby for telling me about the mcdougall plan ). Everything in vegan baking relies on copious amounts of Maple syrup, and I just refuse to spend $8 on sweetener for each dish i make—so I looked into ways to approximate the taste and consistency. – if you’re baking, you can water down organic molasses and mix with some sugar to sweeten. it’s pretty much a perfect match. – for stove things like sauces, you can sometimes get away with agave + a bit of molasses. the taste isn’t perfect , but it can come close. for many stove recipes, and anything uncooked, you can’t really substitute. but if you can… it makes cooking vegan desserts way more affordable. This looks amazing….now if only I had that ice cream maker attachment for my kitchenaid! Wow that looks tasty!!! I can’t wait to make some. @Tara: if you have young kids use the coffe can method. It works and it hilarious to watch. I’ve also found that thrift store have old hand crank ice cream makers every so often. Looks delicious! I love a good ice cream and your recipe sounds simple yet divine! I can’t wait to try it.